NextGen Player - Canada's Premier Entertainment Blog: Are You Canada's Biggest Halo Fan? Listen up all you Halo fanatics, Xbox Canada has a Facebook contest happening right now that's just for you. To enter all you need to do is become a fan of Xbox Canada on Facebook and post proof of your fandom on the wall. The grand prize includes a trip for two to Toronto, the ultimate Halo prize pack and VIP access to the biggest Halo event ever held in Canada. There's only one day left in the contest so if you're interested -- get posting! 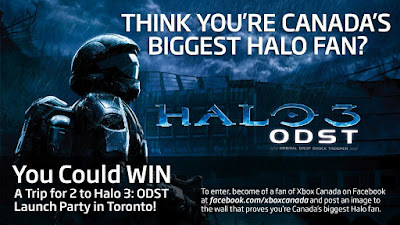 On September 15th Xbox Canada will choose the best entry and send that person on a trip for two to Toronto with one-night accommodations, an exclusive Halo 3: ODST prize pack and full VIP treatment with front-of-the-line access to an exclusive session of Halo 3: ODST Training. In addition to the grand prize, Xbox Canada will also be giving out five Halo 3: ODST prize packs during the contest.